Flat Tires typically fall into two categories. The first type of flat tire happens suddenly when something sharp pierces the rubber of the tire. This sharp object can literally be almost anything - nail, shard of wood, coat hanger, the edge of the road, or even the rim itself if damaged. Sharp objects and debris in the road are a hazard, and you should NEVER drive over them if you are unsure what the hazard is! The sorts of flat tires can cause sudden loss of control as cars and trucks are not designed to adapt to a sudden loss of tire pressure. The second type of flat tire happens slowly over time. These kinds of flats tend to occur because of tiny leaks in the tire. Sometimes a nail or other sharp object can get lodged in the tire. The object pretty much seals the hole, but over time and driving, a tiny amount of air leaks out, and eventually the tire will need to be filled. These kinds of leaks can also occur if the tire does not fit on the rim properly, whether due to damage or improper installation. Either scenario is a real pain, but we are here to help! Please call us for roadside assistance! 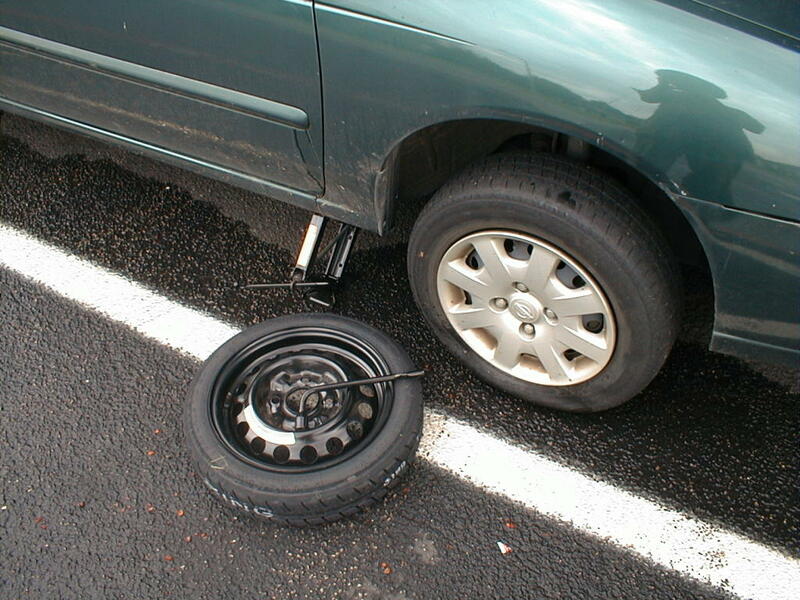 Flat tires, particularly sudden blow-outs, can be VERY dangerous. The first thing you must do is slow down (please don't slam on your brakes!). Slow down and make your way over to the shoulder or side of the road. Do NOT try to drive on a flat tire. This can cause serious damage to the wheel rim, in addition to the already flat tire, and can cost you more money in the long run. Instead, pull over and call a wrecker service - like us! Can't I Just Use Fix-A-Flat? Fix-A-Flat and other canned tire sealants can be a TEMPORARY fix to get you to a mechanic IF you don't drive too fast and the flat is due to a small leak. These sealant are typically sprayed through the tire's valve stem and can provide TEMPORARY assistance, but please get to a mechanic right away. Do NOT pass GO, do NOT collect $200! So...How Do I Change a Flat Tire? Most flat tires can be avoided. First, stay away from areas where debris can collect that might puncture a tire. Construction areas, new housing developments, rough or poorly maintained roads, and suspicious debris can all lead to punctures. We've had someone run over a sod stake before in a older neighborhood, so be on the lookout. Second, ensure your tires are properly inflated. Any mechanic or dealership is able to check your tire pressure, but you can also do so at many gas stations at their local air station. Often, you can just use the valve without having to even pay any money. Do not over- or under-inflate your tires. All tires have a PSI maximum, and often a range, printed on their sidewall. Those guidelines are given by the manufacturer and should be followed. Third, know the condition of your spare tire. Spare tires are like insurance, you hope you never need it, but if you do need it, you're glad it's there. Finally, be smart and safe on the road. Accidents happen, but being alert and attentive helps keep you, the others in your vehicle, and the other motorists safe. And if you do get a flat - reach out to us at 803-667-3792!